In this fast-paced, plugged-in world, we understand it is critical for your Menomonee Falls business to function efficiently and consistently. What does Ontech Systems have to offer? Our trained IT support professionals work with small to medium sized businesses throughout Menomonee Falls to ensure their IT infrastructures run smoothly with little to no down time. We are available to work with your existing on-site IT staff or we can serve as your dedicated IT service on an as-needed basis. Over the last 10 years, Ontech has maintained a 98% client retention rate – one of the highest in the industry, by providing reliable, effective solutions that align with our clients’ current and future business initiatives. 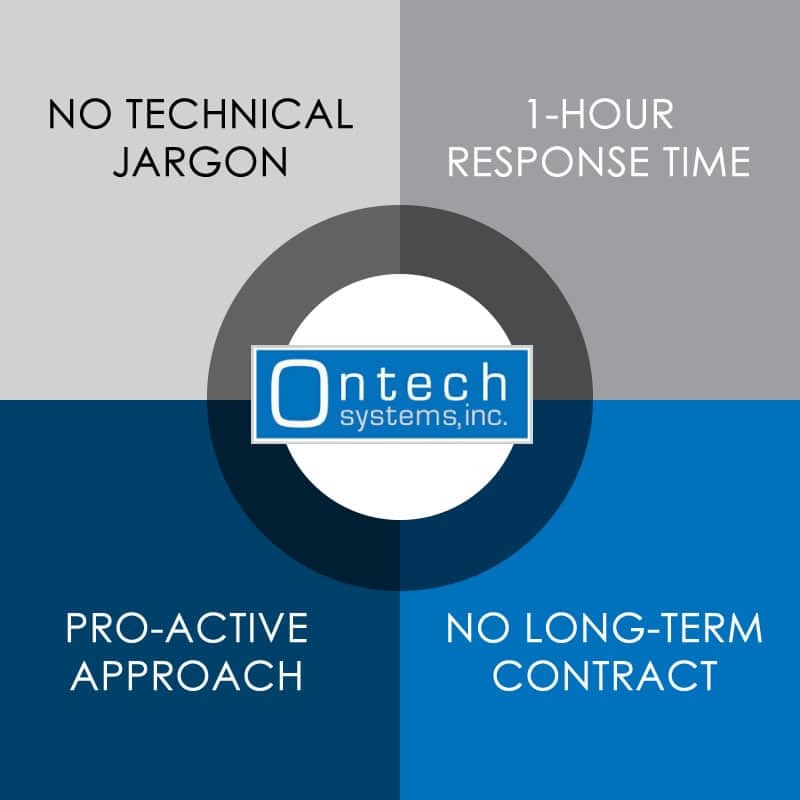 If you’re frustrated with unreliable, unresponsive IT support from your current provider and want to be treated as a priority, Ontech Systems is your IT team. We can assist you with backup solutions, implementing a disaster recovery program, VoIP, updating your server, securing confidential information and much more. IT Support in Menomonee Falls: What Sets Ontech Systems Apart from other IT Providers? Our techs are committed to transparency. We speak a language you understand – no technical jargon. No matter what your level of technical knowledge, you’ll be comfortable with what we are doing and why we are doing it. We’re responsive. You have a business to run—you don’t want to spend all day waiting for an IT problem to be fixed. During regular business hours, you’ll get a phone call or email within an hour of your request. We take a proactive approach. We have all your IT needs covered – from servers, to phone systems, from virtualization, to website needs and even online marketing – our comprehensive solutions allow you to pick up the phone and get answers all in one place. Our technicians will work with you to integrate your overall goals and long-term growth potential into our support plan. No long term contract is required. Our 98% retention rate over the last 10 years speaks for itself. There is no need for a contract when you consistently satisfy customers. How can you get started with Ontech Systems? Call us today to schedule a free, no-obligation Network Discovery. During this network assessment, we will evaluate your existing network and offer ideas to improve the productivity and efficiency of your IT system. Our technician will audit your network and equipment, and explain their findings to you in an easy to understand question and answer session. Some of the things we cover include backup options, securing your data, virus susceptibility, getting rid of SPAM emails and keeping your hardware reliable and up-to-date. Is Ontech Systems a good fit for your business? Call Ontech Systems at (262) 522-8560 or contact us via email and put your IT frustrations to rest. We look forward to hearing from you and hope to become your primary IT provider for your Menomonee Falls area business.